Today we went into the garden again, because it was planned to meet some other family members that we don’t see regularly. It was my grand-aunt, my grand-uncle, my second cousin and her little daughter. My second cousin did not only come with the daughter but also with her dog. Of course, the meeting was with “Kaffee und Kuchen” again, because this is how we network in the family, and it’s probably the equivalent of the British tea time. I am very sure that I destroyed my calorie balance today but sometimes you have to enjoy life. I say that because I ate two pieces of lemon cake, two pieces of marble cake, one cinnamon bun and later even a currant bun because my grand-aunt convinced me that it would be bad to throw remaining things away (laugh). Next time if you want to comment on my blog, you might reconsider. I am generally not in the mood to talk with content thefts. Do me a favor and hang around somewhere else. 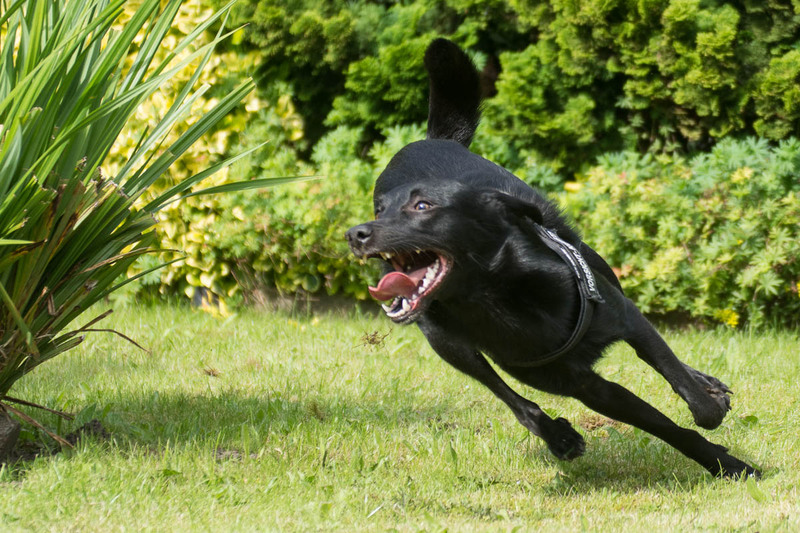 That is an excellent action shot of the dog. He looks very fit and healthy too. Is he a labrador or part labrador? This is not a purebred dog… my cousin can only guess what is in the mix. She saved the dog from Bulgarian streets, or in other words, she got the dog from a charity in Hamburg that saves street dogs in Southern Europe. The sad story is that the dog was basically terminal ill due to a blood cell disease, and her vet said the dog would only make a year, but now the dog is already one and a half year old and very healthy. She said treatment and drugs did cost a lot of money but it was worth it because now even her vet said that the dog is ok now. I can’t remind what kind of disease she meant, but it had something to do with blood cells but they are ok now. At the time her vet was still pessimistic, my cousin assumed that he wanted to put the dog to sleep to save her costs, but instead she paid a lot of money and as it seems, it was worth it. I was surprised, because I agree, the dog looks healthy and fit, and if she wouldn’t have told it, I wouldn’t have expected that the dog was once very ill.
That is a great story. I do admire the dedication of people who take dogs from shelters especially those that are ill and cost them a lot of money for vet fees. In this case your cousin has been amply repaid for her care as this now looks to be a beautiful, healthy, happy dog. I would never have guessed from your photos that it had come so close to death. I was wondering if it had a bit of German Shepherd in the mix with those ears but it’s hard to tell with mixed breed dogs. Same here, I admire such people too. But I guess I am different. I’d pay anything I have if my cat would get a disease and if I can save her by putting all my saved cash on the table. But I am probably less interested to get a shelter pet that costs me a fortune right away due to a disease. I donated to the shelter in the past (maybe you remember, I told you once that my ex girlfriend is collecting pet food donations once in a year and brings it to the shelters)… or I would even help to transport and carry food donations to the shelter… that’s my way to help. But when I hear people help directly by giving an ill creature a home, hoping for health recovery of the pet by investing into the chance, I admire it but I can’t do the same. It would probably be a different story if I would have way too much money. I believe in most cases the chance to help is still very little, especially when you hear the particular shelter pet has a very bad disease… In the case of my cousine it’s probably one of those happy endings. But it’s indeed a very good happy end… and she can be proud of what she did but since she is not rich either, it was definitely financially risky. Yes it takes a special kind of dedication to invest so much money and time into an animal that may die I don’t know if I could do it either but luckily such people do exist. A good friend of mine used to foster dogs from shelters temporarily until they were adopted. Now she can’t do that she crochets dog coats for shelter dogs instead.